Your friends the amateur intoxicologists here atMadtini Research Laboratories have come up with a number of Madtini Original cocktails to celebrate Valentine’s Day. 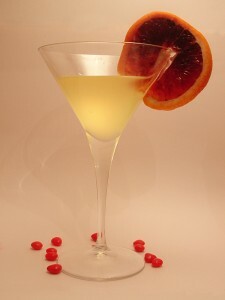 This, the fifth of our Valentine’s Day Passion Potions, celebrates love everlasting. That rare form of passion that lasts forever. … this cocktail is for those long-time, forever, eternal lovers. Equal parts of sparkling wine and champagne in a cocktail glass. Garnish with blood orange. Learn To Create Irresistible Drinks!